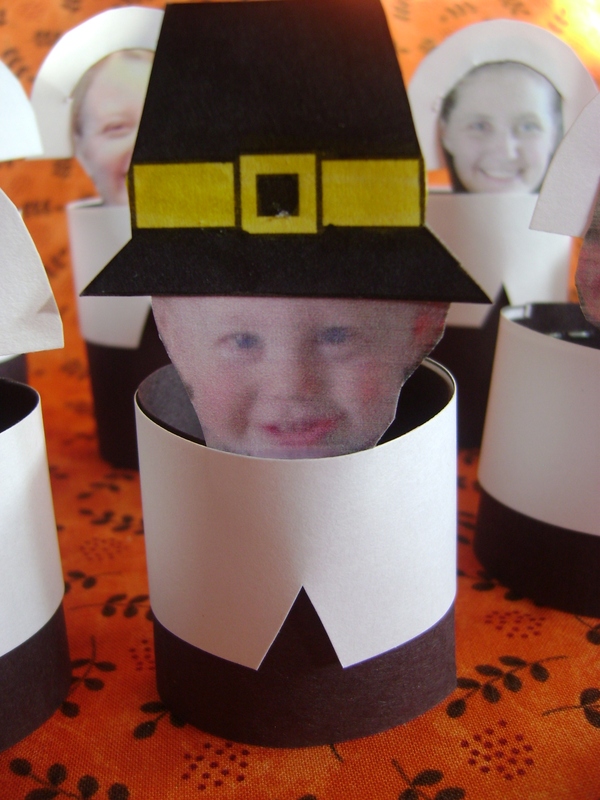 Awwww….Wouldn’t you just love some cute little pilgrims–like this, on your own Thanksgiving table? Print out the pattern–at the bottom of the page and cut out the pieces. 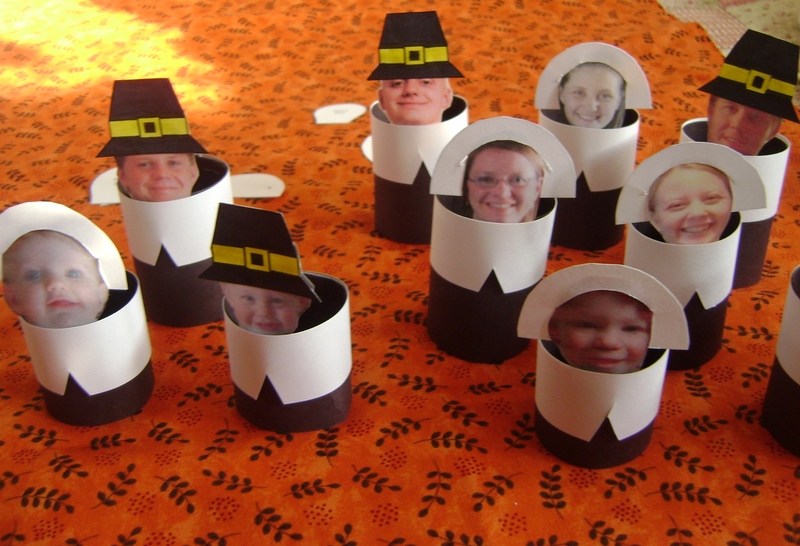 Using the pattern, cut out enough pilgrim pieces for each member of your family. 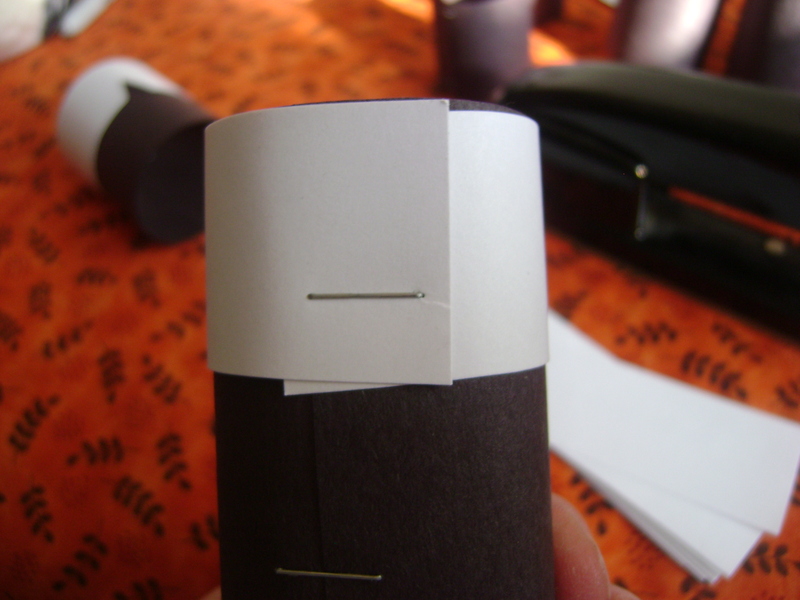 Roll the black rectangle and staple it in place. 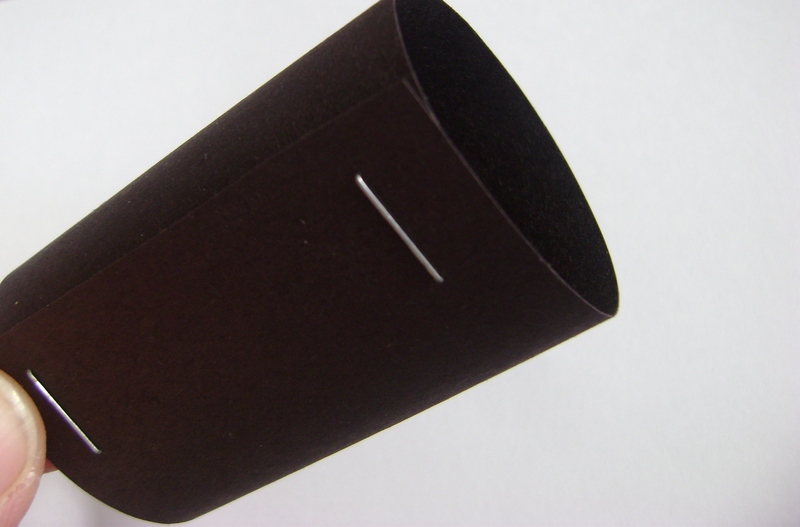 Wrap the white collar around the black tube–and staple. 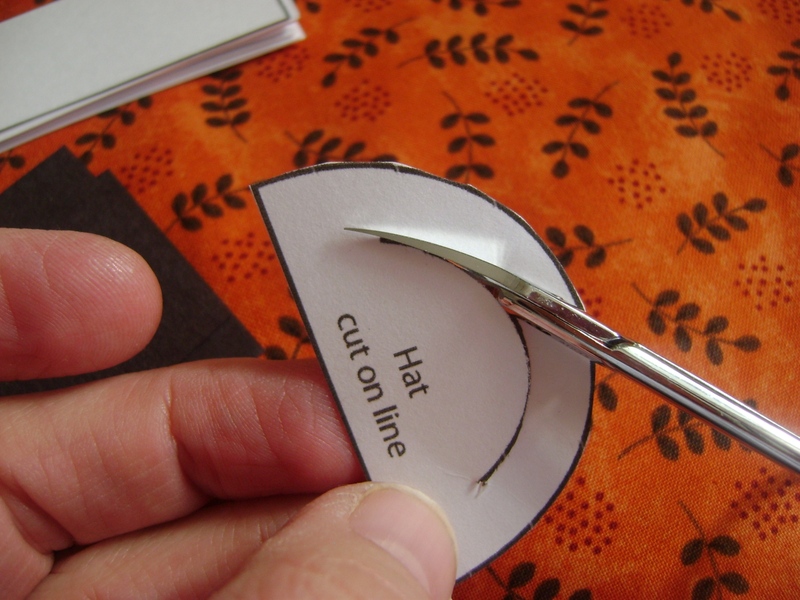 Using embroidery scissors–cut along the line on the pilgrims bonnet. 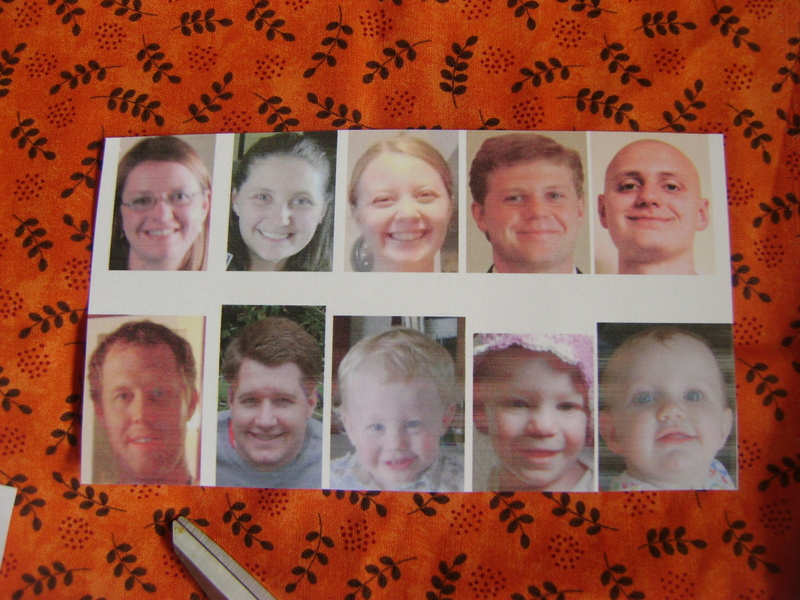 Print out pictures of your family–I made them all about 2-1/2 inches tall. Cut them out. 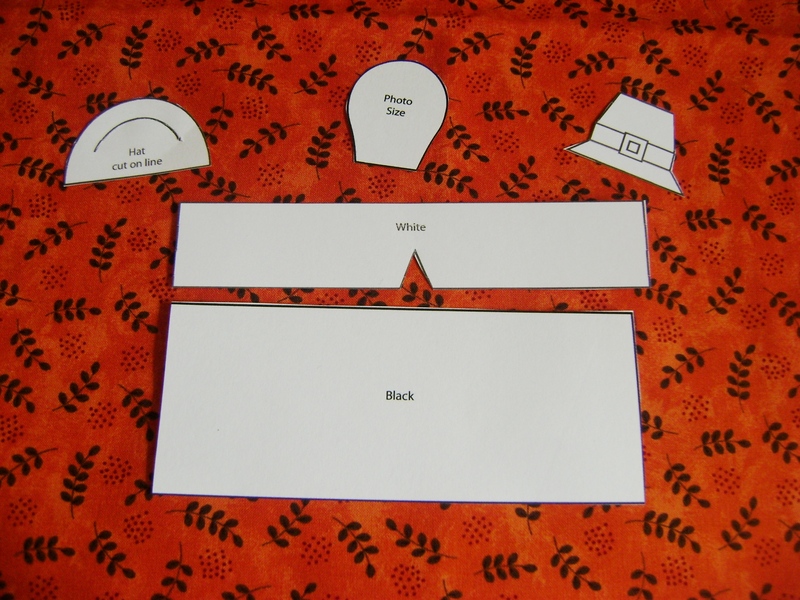 Glue the pilgrim hat on the boy pilgrim’s head. Slide the girl photos into the white caps. 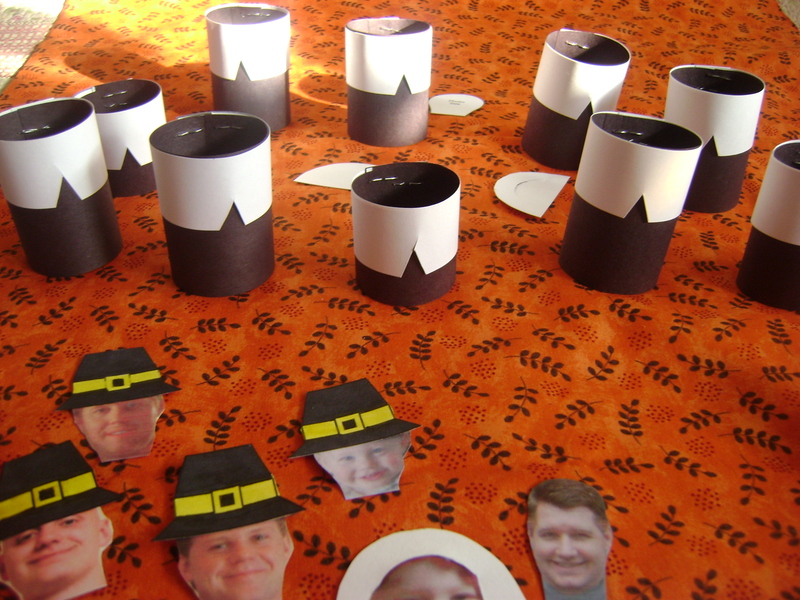 Now you’re ready to put your pilgrim together. Oh, and for the babies bodies, I trimmed the black body pieces about 1-1/2 inches–so they were shorter. 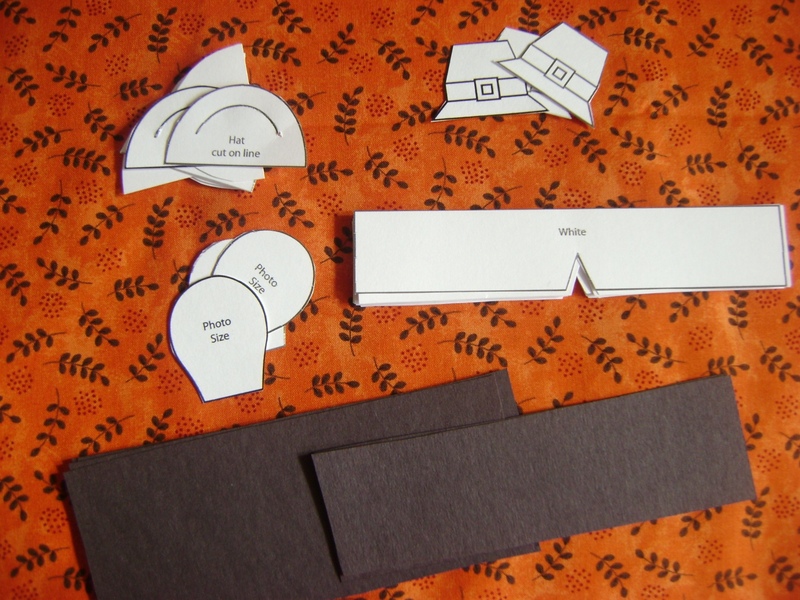 Slide the heads between the black piece and the white collar and glue lightly in place. Let them dry for about 30 minutes and they’ll be set for your feasting table. No need to write anyone’s name on these guys because the kids will love finding themselves on the plate! 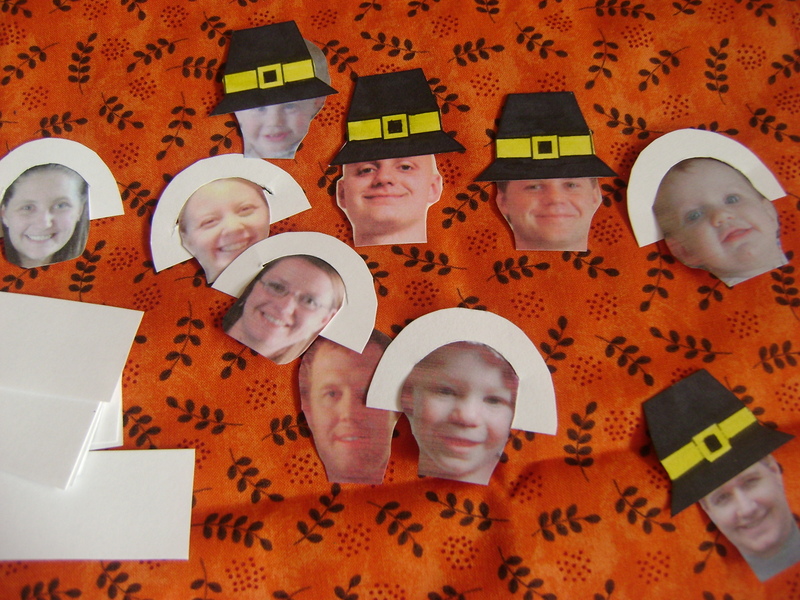 For the Personal Pilgrim Place Card Pattern–simply click on the link below. I laughed my head off as I was making them. It felt like that “Elf Yourself” thing we did on Halloween. What a crack-up! 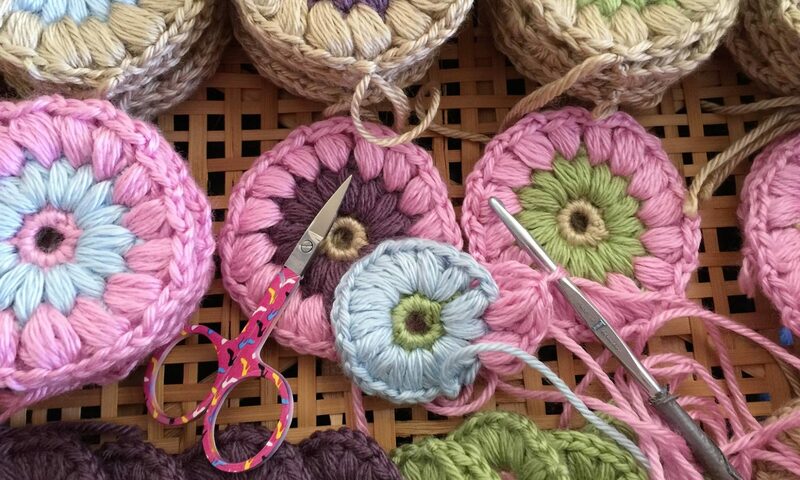 I teach at my daughter’s house right this minute and I’d love to see you and have you visit the class. Email me: Launi@graciousrain.com and I’ll send you the address. In December, I will move to the Mothering Your Way offices in Orem. I absolutely adore your family, they are ALL so cute! I miss missionary boy too. He was always good for a laugh. I love this idea! 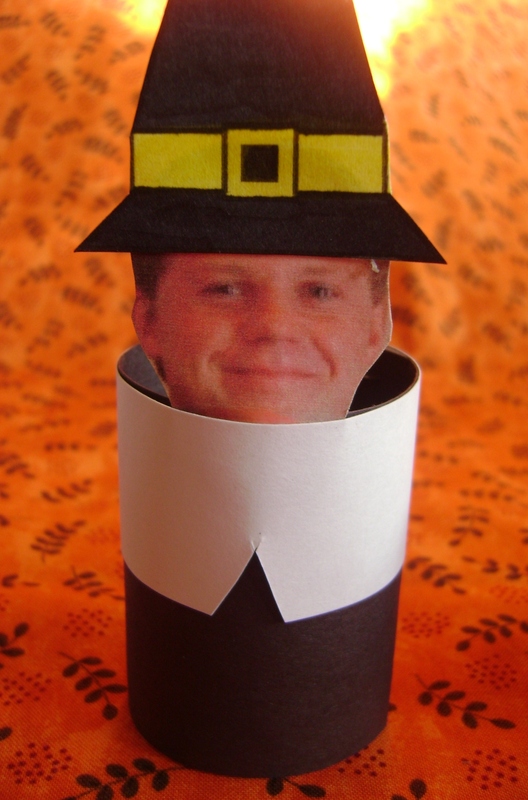 It made me weepy to think of leaving my Daney boy out of the Pilgrim party. So we’ll just have him sitting on the table by an empty seat. I’m afraid it will look like we are waiting for Elijah or something. Not Elijah…just Dane. Oh my gosh!!! Those are so stinkin cute I can’t even take it!!! 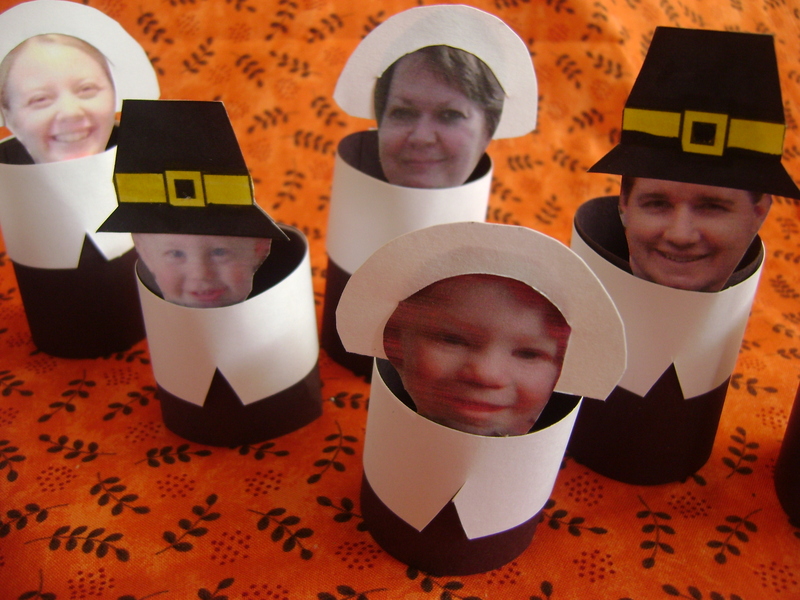 Someday when we do our own Thanksgiving I’m so doing these!! Ok, so how come every picture of Jacob looks like you just ‘caught’ him doing something…. does he hate getting his picture taken? It would still be fun to let the kids play with them–whether or not you need a placecard—don’t you think? It’s just that mischievous smile of his. I like it. These turned out AWESOME!!! 🙂 I need to get better at printing pictures, not just taking them, because stuff like this is SOOO great! Next PostNext A New Moon! !